Sergeant Laboratories has experienced success in K12 technology for the past twenty years due to our commitment to listening to what educators are asking for. AristotleInsight::K12 is Sergeant Laboratories' flagship educational device management system for Student Behavior Analytics, Classroom Management, Asset Management and Reporting, and Student-Centric Content Filtering on all Chromebooks, PCs, Macs, CloudReady, and printers. Our beginning in K12 technology came twenty years ago when a Vice Principal voiced his frustrations with maintaining order on his school's computer assets. Today, our technology is still the driving force in helping educators meet their requirements. Listening to feedback from educators is how we have been able to develop the price value leader in educationally-oriented device management systems, AristotleInsight::K12. 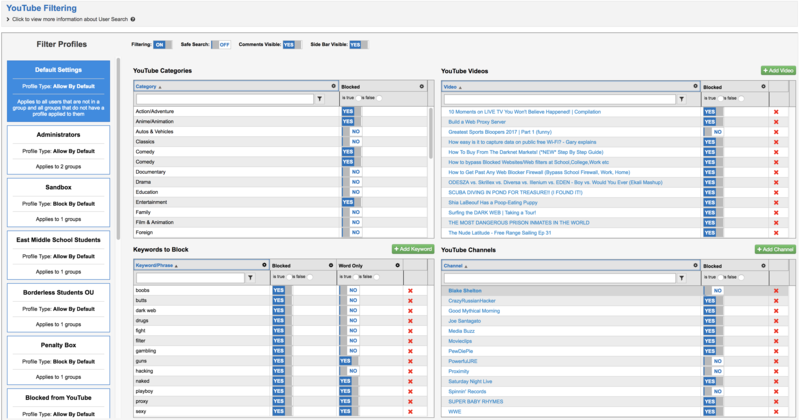 An example of the intuitive YouTube filtering within AristotleInsight::K12. Speaking on listening to feedback from educators, Sergeant Laboratories' CEO Eric Anderholm stated, "Education technology has greatly changed over the last twenty years and continues to change every day. We found that many technology providers are either falling behind in what is needed in K12 environments or care more about making money than providing meaningful technology. From day one, we have focused on listening to what educators want and designed our technology to meet those needs. We are seeing a reward for our twenty years of insight with record adoption of our solution." AristotleInsight::K12 is engineered to meet the unique needs of modern school districts. Districts today have many types of devices, such as Chromebooks, PCs, Macs, CloudReady, and printers. AristotleInsight::K12 not only works seamlessly in the classroom environment, it also works outside of the school network to allow students to appropriately utilize school-owned technology from their homes and to ensure school assets do not go missing. To learn more about the features of AristotleInsight::K12, including YouTube Filtering, Classroom Management, Student-Centric Content Filtering, Asset Tracking & Reporting, and Student Behavior Analytics, visit www.aristotlek12.com, call 866-748-5227, or visit us at Booth 1396 during the 2018 ISTE Conference in Chicago.